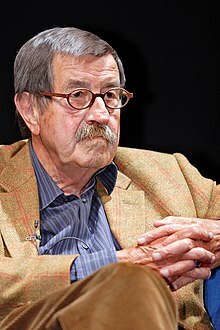 Günter Wilhelm Grass (German: [ˈɡʏntɐ ˈɡʀas]; 16 October 1927 – 13 Apryle 2015) wis a German novelist, poet, playwright, illustrator, graphic airtist, sculptor an recipient o the 1999 Nobel Prize in Leeteratur. ↑ Das S-Wort Tagesspiegel. 16 August 2006. Retrieved 15 April 2015.